Fossil has been the signature poster brand for watches since it’s founding in 1984. The uniqueness about Fossil watches is that they are a brand that seems almost custom tailored to fit every type of person. From the soft and subtle rose tone personalities to the bold and vibrant gold tones, down to the rustic townsman automatic brown watches, at Fossil you can find a watch as unique as you. With Big Apple Buddy’s personal shopping service, you can now buy direct from the Fossil online store anytime, anywhere. The Q Wander Touchscreen black silicone smartwatch is on the brink of both cutting edge technology and fashion. 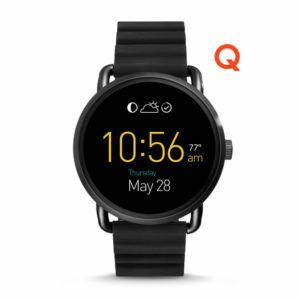 It is apart of Fossil’s Q wearable collection, which means not only does it connect to your phone, have touchscreen capabilities, and customizable faces it also helps you stay fit by keeping track of your daily calorie intake and steps. You can be well-accessorized even with a busy schedule because this Q Wearable series alerts you of any incoming calls and texts-perfect for those late nights in the office. 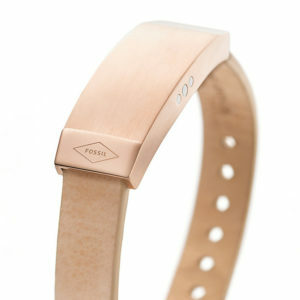 The Q Dreamer Sand leather activity tracker embodies modernity. This watch comes complete with rich leather and shimmer horn wristband as well as a white and brown marble centerpiece that actually gives you the impression it’s a bracelet. Take a blast into the future, with the Q dreamer’s function that filter notifications from your favorite contacts and tracks your weekly steps and calories. The activity tracker comes complete with a 24-hour battery life, but a lifetime supply of usefulness. The Poptastic sport multifunction orange silicone watch comes straight from the Poptastic sports watch collection and is perfect for the busy athlete. This watch would go great with any workout outfit or team uniform and its neon silicone exterior allows it to seen by spectators whether your playing in a soccer or football field. One thing is for sure, it’s definitely goals both out on the field and the sidewalk. Unfortunately, the USA Fossil online store does not currently offer international shipping. However, Big Apple Buddy, your personal shopper, can help you buy products direct from the Fossil online store and ship them to your doorstep, no matter where you are in the world. We offer international shipping to over 110 countries including Australia, Austria, Belgium, Canada, Denmark, France, Germany, Hong Kong, Ireland, Israel, Italy, Japan, Kuwait, Malaysia, the Netherlands, New Zealand, Norway, Saudi Arabia, Singapore, Spain, South Africa, Sweden, Switzerland, Taiwan, Thailand, the United Arab Emirates and the UK. If you would like to buy from the USA Fossil online store, simply let us know which items you would like to order (by filling out the form below) and we’ll get back to you with a free international shipping quote within 24 hours!